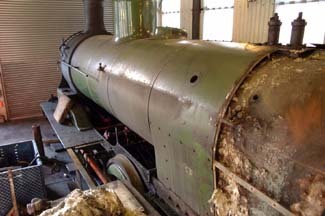 No 29 is currently in the workshops at Grosmont NYMR to have some leaking firebox stays replaced. 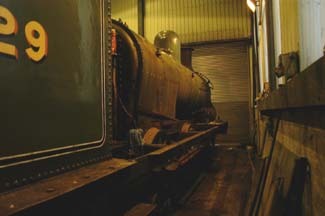 The photographs show 29 with her cab and tanks removed to gain access to the stays. The plan is to replace the leaking stays and those adjacent to them. 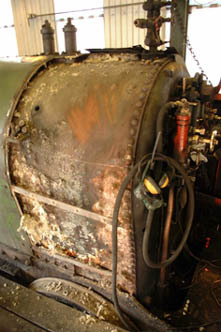 The calcium deposits from the leaking stays can clearly be seen (towards the back of the boiler) in this photograph. 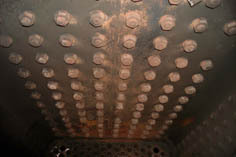 Click image for close up of leaking stays. 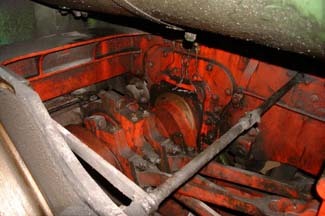 Inside the fire box looking at the crown. 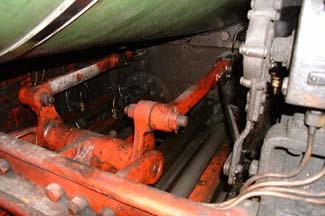 With the tanks removed for access to the outer firebox, it is possible to take a close look at the motion from a perspective not normally possible. 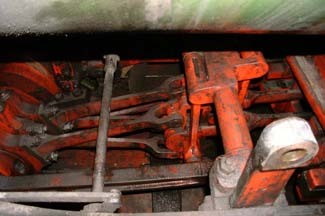 Valve spindles & piston rods.